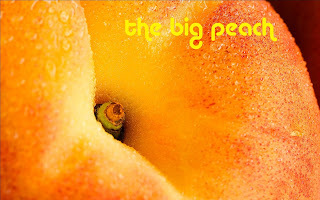 The Big Peach's self-titled EP is one of the most promising and exciting debut releases we've heard for a long time. A very back to basics approach gives the five songs a freshness and an endearing infectious energy that often gets lost by bands striving for supposed perfection rather than making genuine honest connections. Give Up Askin' kicks off the EP with an instantly memorable guitar riff, a theme that runs through the five songs whilst the breakdown also has judicious use of a harmonica to accompany it. It deals with a tale of unrequited love "oh baby i'm going to keep on askin', she said oh boy you got to give up tryin'", and like so many of the lyrics there's no hidden meanings or mystery to it, just a refreshing sense of not overegging the pudding. Politican's lead guitar line feels like it's just about to go horribly out of tune at the start but that just emphasizes the lack of pretension at play here, as does the simple plaintive commentary about the role of the media - "don't believe what you see on your TV screens, you know it's the joker who writes your magazines" - and the real intentions of those elected to serve us - "your politicians, they're out having fun, you think they care, but it's all for one." By not taking sides nor jumping on any bandwagon, their message is even stronger. Game We Play and Free And Easy are similarly straight and direct assessments of the to and froing of relationships. Lyrically they pull no punches, but there's no ducking, diving and posturing for show at play here either. Again there's a rawness to the playing and the recording that gives these songs so much space to breathe and for the genuine timeless quality of the musicanship to shine right through. They save the best for last though. When we saw them play live and they finished with It's Alright Mama, we were searching for the lyrics we remembered convinced it was some genius track that had somehow eluded us over the years. But we're pleased to report it's an original and a glorious piece that feels like an impromptu plug in and jam at the back end of a whisky-fuelled open mic night. There's successful bands over the years whose own PR would have their songs sounding this thrillingly loose and real rather than a turgid rehash of the past. It's Alright Mama is joyously unassuming but it grabs you, makes you grin at its carefree audacity and it doesn't let go until it's got you hook, line and sinker. Intentionally, or not, The Big Peach EP feels fantastically lo-fi, like they've turned up, plugged in and turned their nose up at any sort of studio trickery. Whilst bands strive and stretch and move away from the basics of what they do to get attention, it's this simple uncluttered approach that makes The Big Peach so fresh, invigorating and exciting and makes them stand out a mile. They play Manchester Ruby Lounge (August 26) and Manchester Zombie Shack (29).